Japanese Prime Minister Shinzo Abe’s economic policies dubbed as “Abenomics,” are anchored on the “three arrows” of fiscal stimulus, monetary easing and structural reforms. While the public has already seen the first two, it has yet to be familiar with structural reforms, which Abe was not very specific on. A new set of recommendations to Abe by a government panel aims to address this third arrow and one suggestion included might just surprise you. The proposed plan was submitted by the ruling Liberal Democratic Party. It listed decreasing corporate taxes, reforming public pensions and in one startling suggestion, to increase the number of professional baseball teams in the country by adding four more to the league. The report stated, “Prosperous baseball teams could strengthen attachment to regional cities and help local economic thrive.” It further cited the example of the U.S. Major League Baseball, which has doubled its teams since the 1960s. The report further recommended certain cities where new teams could be formed such as Okinawa and Shizuoka. Despite this, some analysts have expressed doubts on the feasibility of this recommendation. 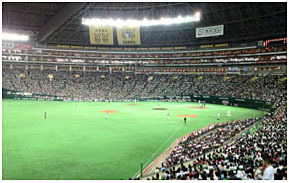 A professor from the Sports Sciences Department in Waseda University, Munehiko Harada, said that this would only work if there are companies willing to finance and sponsor these new teams. He added, “Without a solid financial foundation, it would be hard to poach good players and balance the strength of the teams.” Many of Japan’s pro baseball teams rely on corporate sponsors. Some even take losses as tax-deductible marketing costs for these sponsors, like Yakult Honsha Co. and Orix Corp.
Japan’s professional baseball league suffered from losses a few decades ago and if it weren’t for the timely buy-out of Rakuten Inc to buy one of the clubs, the two-league system may have crumbled. Abe will announce his new set of reforms early next month based on the recommendations of the LDP. It remains to be seen if the baseball suggestion will make the cut or will be totally scrapped out.